You won't believe its made with zucchini! Prepare single pie crust using pie crust mix (half of the bag). Chill for at least an hour, or overnight if possible. Put prepared zucchini, water, syrup, extract and peach drink mix into a saucepan and bring to a boil. Boil until water evaporates, about 30 minutes. The zucchini now looks and tastes like peach! In a small bowl, combine the Thick 'n Saucy and Natural Sweet White. Add to the "peach" mixture. Add the lemon juice, lemon rind and nutmeg. Mix well. Grease a pie baking dish, then pour "peaches" into it. Preheat oven to 375 degrees. Lay out sheets of parchment paper or aluminium foil on your counter and lightly dust with flour. 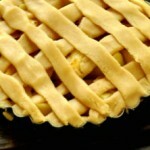 Remove ¼ of the pie crust from fridge and press it into a flat disk. Use a rolling pin to roll the dough from the center outward to ⅛ inch thick. Work quickly! Slice the dough into long strips and lay them in a criss cross pattern on top of the "peaches". Repeat with remaining pie crust. 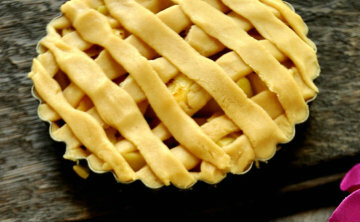 Put small pieces of butter in the holes created by the lattice crust. Mix together some LC-Natural Sweet White, nutmeg and cinnamon and sprinkle on the crust. Bake for 35 minutes on rack in middle of oven. Move rack to top for another 5-10 minutes, until lightly browned.